Duo-Link Universal is a dual-cured, resin luting cement indicated for the permanent cementation of all indirect restorations, endodontic posts, cement-retained implant restorations, and veneers. Duo-Link Universal is radiopaque and intended for use with a bonding agent. It is available in two shades (universal and milky white) and comes packaged in an 8 g automix syringe. The working time is 2 minutes; self-cure time is 3:30 minutes. Duo-Link Universal can be light cured with an LED curing light for 2-3 seconds per tooth surface for quicker clean-up of excess cement. Each Syringe Package includes one syringe of cement with 15 mixing tips. 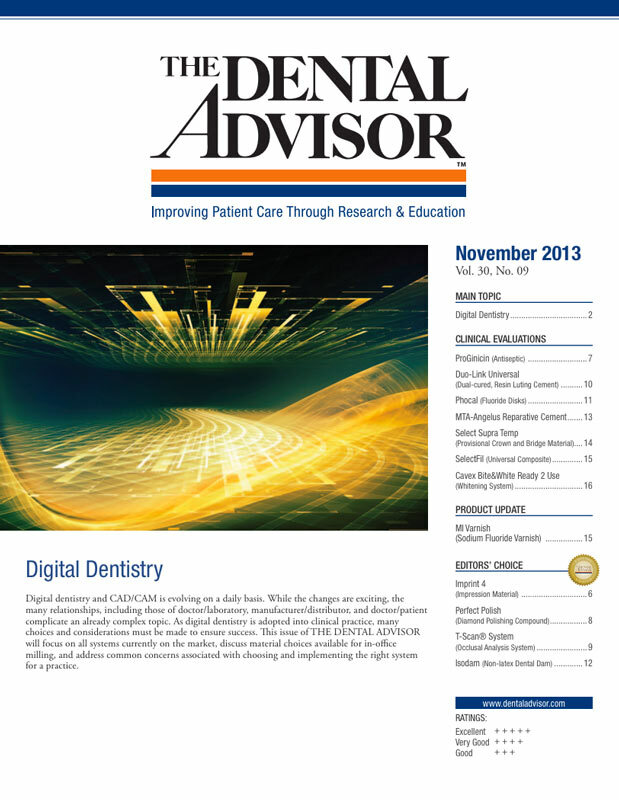 Duo-Link Universal was evaluated by 13 consultants in 260 uses. This adhesive resin cement received a 93% clinical rating. Duo-Link Universal is packaged in familiar 8 g automix syringes. Mixing tips can be used to dispense the cement onto the restoration or, with the addition of the angled intraoral tips, directly into the tooth. While the cement requires the use of a bonding agent, and one is included in the System Kit, the bonding agent was not included in this evaluation. Instructions regarding the use of adhesive with Duo-Link Universal are limited. It is left to the user to determine which type of adhesive (light- or dual-cured) and technique (self- or total-etch) to use. A technique card instructs the user on cementing restorations with Bisco primers and adhesive. Extrusion from the automix syringe is smooth and produces a homogeneous mix. Duo-Link Universal cement has enough body that it is not runny, yet it flows well under pressure. Working time of Duo-Link Universal allows placement of multiple restorations before gelling starts to occur. The cement is not overly sensitive to the LED light for tack curing, and optional curing of 40 seconds per surface can be done; self-curing time was within the acceptable range for consultants. Easy clean-up after tack curing is a positive feature of Duo-Link Universal. A 3-4 second cure per surface produces a firm gel that can be peeled off the margins; the cement is quite translucent (Milky White shade was not evaluated) and the excess is not always visible. After final curing of the cement, it is hard and more difficult to remove. Complete cleanup and flossing after tack curing are recommended. 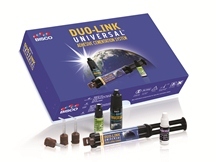 Duo-Link Universal is compatible with many adhesive systems and can be used to cement restorations of all substrates. Fifteen percent of consultants rated Duo-Link Universal better than other adhesive resin cements they had used and 69% rated it equivalent. Forty-six percent would switch to Duo-Link Universal and 77% would recommend it. Make sure that your bonding agent is compatible for use with a dual-cured cement. Many bonding agents require the addition of a dual-cured activator. Check carefully for excess cement. It The Universal shade is nearly clear and hard to detect visually.